The process should always begin by reviewing the association’s governing documents to understand the community’s current parameters concerning the posting of signs. If the board and its legal counsel determine that modifications to enhance the existing rules under the community’s governing documents are in order, it is advisable that they undertake the membership voting process for amending the documents with the new regulations rather than adopting the rule as an action of the board. 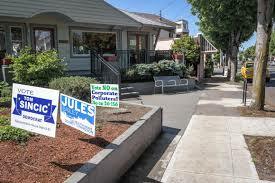 Boards should also consider adopting reasonable measures, such as the permissible sizes and locations for the signs, how long before or after an election they may be posted, and safety issues including vehicle lines of sight. Once the regulations are established, enforcement must be fair and consistent. Any partiality by the association in its enforcement actions involving political signs could expose it to legal liability. Associations should also bear in mind that the election season is relatively short-lived, so any extraordinary efforts that they may take to address this issue may end up only having a minimal impact. By keeping all of these considerations in perspective and working with highly qualified and experienced legal counsel, Florida associations can effectively implement and enforce rules and restrictions governing the displays of political signs in their communities.